First off, my life in 2018 was generally very busy. The layout was not touched during the entire year, but I managed to finish 5 cars for the layout. The first (and most challenging) cars completed were a trio of Branchline Trains 50' double door boxcars. I started these cars while listening to hockey on the radio in February or so. These cars represent a trio of Illinois Central Centralia Shops double door cars. 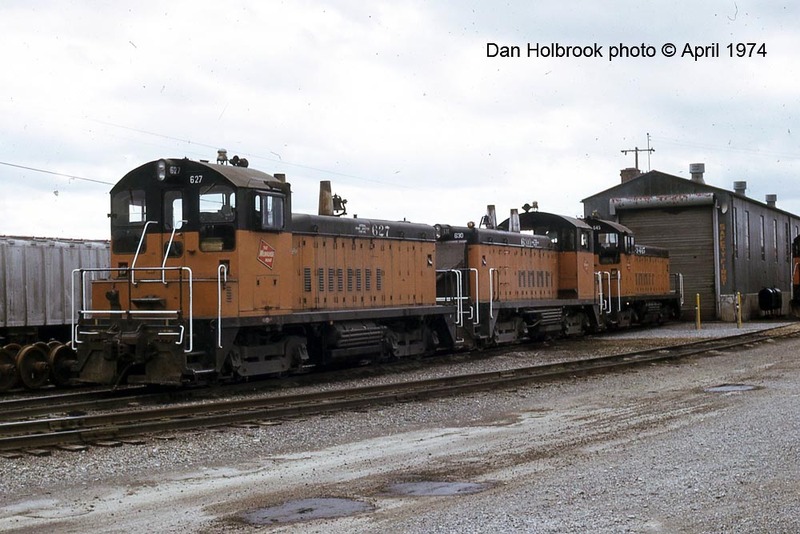 These are important for my layout because I have acquired a photo - posted above - of a pair of them parked at the Dishman (UP) depot house track, both in original brown "Main Line of Mid-America" paint. 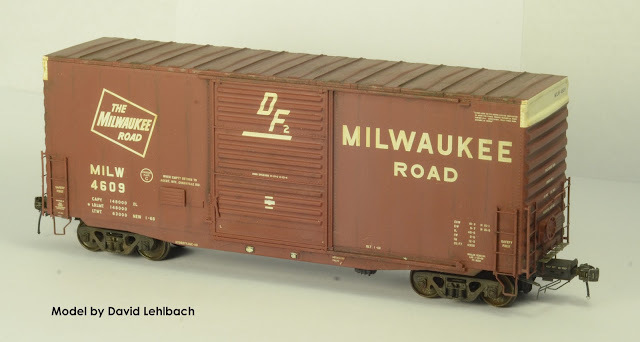 The third will be an orange car since orange IC boxcars are found all over the US - it is hard to find a Milwaukee Road, UP, or BN train that does NOT have an IC or ICG boxcar in the consist. One of the interesting features of these prototypes are that Illinois Central equipped the cars with Pullman-Standard components: ladders and grab irons. Because of that, I scrapped the Branchline Parts and used Kadee ladders and grab irons, which look great since they are thinner in profile. The cars have several aftermarket parts applied. The aforementioned Kadee grab irons and ladders. Kadee brake wheels. Plano Model Products running boards and brake steps. A-Line stirrup steps mounted underneath like they were at Centralia Shops. I also built custom crossovers on the A end of the car with styrene scrap and wire. I rebuild the B-end details with wire, and built up the bolster area with styrene as you can see in the photo above. The cars were completed with Moloco draft gear. Here is one of the two brown cars, finished. These cars were finished with Scalecoat paint that I mixed from PRR freight car red and boxcar red (#1). Decals are new sets from ICG Decals - click here for a link. ACI labels are also from ICG Decals. Chalk mark decals are from Sunshine Models. Trucks are from Tahoe Model Works, outfitted with .088" wheels from Tangent Scale Models. Weathering is with oils. As I write this, I realize I forgot to add air hoses. Here is the orange car, finished. As I write this, I realize I forgot to add air hoses. This car was finished with Scalecoat paint that I mixed from Reefer orange with a small amount of ATSF red. I sprayed the car twice since the first version was too orangy - I went overboard with the red. Decals are from another new set from ICG Decals - click here for a link. ACI labels are also from ICG Decals. Trucks are from Tahoe Model Works, outfitted with .088" wheels from Tangent Scale Models. Weathering is with oils. The next car completed was significantly easier. It is a Tangent Scale Models 40' PS-1 "Mini-Hy" cube boxcar with the stock - correct - Barber 70 ton roller bearing trucks. It has been outfitted with .088" wheels from Tangent Scale Models. This car is otherwise out of the box, with weathering. For this car I experimented with Mig colors (streaking effects, washes, etc) which is very similar to weathering with oils - although they require some thinning for my taste. I model 1973 so this car is only 5 years old at this point. It will serve by carrying inbound appliances to the appliance warehouse in Spokane. The last car is a few years in the making since I kept coming back to it so I didn't go overboard. It is a Moloco Soo Line General American RBL boxcar. I added an ICG Decals ACI label, and weathered the car with oils. The model has been outfitted with .088" wheels from Tangent Scale Models. 2018 was not strong for finished models, but I do have quite a few projects in progress so hopefully 2019 will be better! Thank you for reading! With the dawn of 2017 upon us (3XX shopping days left! ), it is time to take a look back at this past year and see how I did against my goals. I firmly believe that building a layout is a project management exercise (yeah, I am no fun), and to get to some level of completion you have to set goals. Last year, I updated this blog page with my goals for 2016. That page is here. 2016 Goal #1: The lights need to be wired. Check. In 2015 I installed 9 or so T8 light fixtures but I did not wire them. They are now wired up in several circuits and boy, do working lights make a difference for the feeling of going somewhere! I also had an electrician install some outlets for some portable lights to be installed that will hang from my soffits but allow easy access to them in case the utility lines need maintenance attention. 2016 Goal #2: Finish Dishman subroadbed and begin laying track. Check. The Dishman scene subroadbed was installed shortly after I set this goal late last winter. This included some thinner profile plywood for the Sprague Avenue overpass so when I build the bridge I don't need to remove too much subroadbed. The roadbed installed was the wood luan plywood that was described in last year's post. I then made a mixture of drywall mud from the powder, and spread a thin mixture to give a ground base. I also created some roadbed templates so I could "drag" the drywall mud to create a sloped ballast shoulder with proper drainage, as outlined in an issue of RMJ in the 1990s (Dan Holbrook and Jeff Lemke article). Finally, the roadbed and scenic base was painted with a brownish base color that Matt Sugerman recommended since it is close to the dirt color found in Eastern Washington (where we both model - see photos). Additionally, because my friends John Bauer and Tom Casper visited fom Chicago for 4 days, we were able to get all of the track down in the scene! John was able to lay all of the track for the Dishman scene. While he did that, I rebuilt seven commercial ME and Shinohara switches to Dan Holbrook's standards. I will do a post on this rebuild process with photos at some point to describe exactly what this entails, but it includes isolating the frogs (which are all powered up with polarity reversal) and rebuilding the header blocks, and adding some other detail as well. Dan's method is fairly easy and makes them look really good - and they include most of the detail a turnout should have to be convincing. 2016 Goal #3: Install DCC. Check. The NCE DCC system was installed successfully. While John and I worked on the track, Chicago friend Tom Casper performed a multitude of electronic-related tasks including installation and configuration of the DCC system. He built a panel with kill switches for the three layout power districts. He installed and configured the circuit breakers. He also installed installing and performed troubleshooting for the reversing unit for the wye at Dishman. We had alot of trouble getting that to work - we discovered it needed to be wired independently of an "uphill" circuit breaker. As a capstone to the Dishman scene work, Tom also helped alot with feeder wiring both in the visible scene as well as the helix, and also helped with installation of Blue Point turnout controllers that include built-in polarity reversing switches. 2016 Goal #4: Finish switch engines. Started. I asked for help from Paul Federiconi and Chris Thompson for the three ProtoWalthers MILW SW1200s needed for the yard, industry switching, and CDA local. Numbers 627, 630, and 645. They now have lights, sound decoders, and detailing. I need to weather them and will do so in 2017, hopefully. So all in all, the layout is coming along. Here is a video that kind of shows it all, with a Plummer Turn returning to Spokane running through the middle of it. Please note: these U28Bs have crappy sounding Tsunami decoders (too much electronic sound, and sound that starts after the locomotive is already moving - boo!). They will be swapped out for Loksound "Full Throttle" down the road. And here are some images of the Dishman scene. First, let's start with the wye scene. In the foreground and at right is the Milwaukee line headed toward the helix (and going down), headed toward Couer D'Alene and Metaline Falls. At left is the far leg of the wye. This was likely used to turn trailer flats and autoracks as necessary and is an essential part of the layout operation. In the upper left corner that leg of the wye (heading South in real life) ducks into the helix, with the switch unfortunately in the helix, but accessible. Finally, the UP mainline is in the back of the scene, with the depot located prototypically correct behind the boxcar - or will be someday when I build it. The boxcar is sitting on the house track behind the depot. My only photos of that house track show 2 IC Centralia built 50 foot boxcars on that track. This next photo below points the camera 90 degrees from the previous photo and looks down the aisle toward the furnace. This is more of the Dishman scene, and starts with the wye access tracks in the foreground. The runaround track and Dishman house track layout was tricky due to space constraints so John and I decided that those two chained turnouts had to be handlaid in place. Then, the mainline (at left) and runaround track (at right) cross over the future Sprague Avenue bridge, which has been constructed with the bridge in mind. I have a temporary piece of cardboard down to show the 4 lane highway, and my son has loaded a grain truck which is crossing underneath the UP (MILW trackage rights), Eastbound (loaded should probably be going the other way toward the elevators in Spokane, but he doesn't know that). Behind the highway is the Porta-Pool and Morrison Brothers Seed industry track to the left, with a boxcar spotted on that track. That track declines in elevation like the prototype. To the right is the weird back and forth arrangement to get to Appleway Fuel, the only BN-served industry on the layout. The reason that track arrangement is like that is because the former SC&P interurban right of way was abandoned with GN building an access to the UP back in the 1960s. I didn't freelance this; this is accurately modeled here. Here is a track level railfan photo of the Morrison Brothers Seed warehouse track taken from the UP right of way above Park Road (on the overpass). Finally, here is a view of the returning Plummer Turn on UP trackage rights, passing by the (future) site of the UP depot. 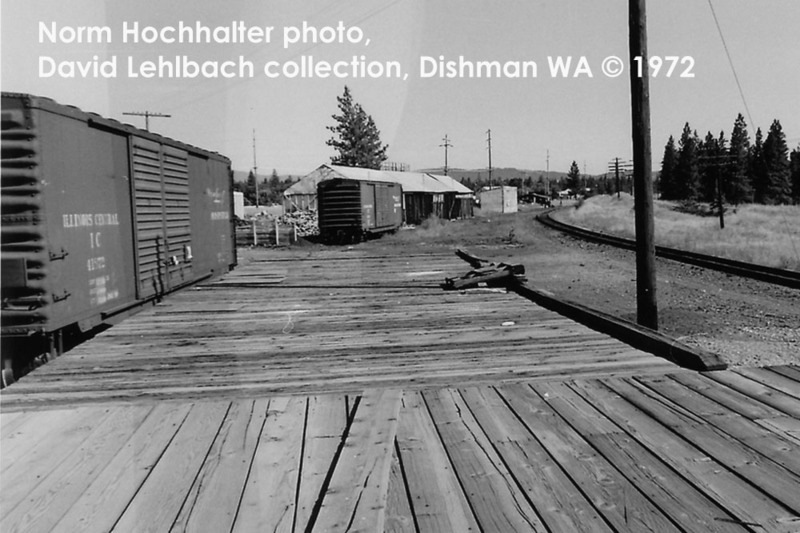 Install roadbed in Fancher Yard (MILW Spokane Yard). This includes the 2 UP "visible staging" tracks behind the MILW yard. I need to think about whether the yard will be laid at a different height than the surrounding trackage. Start laying track in Fancher Yard. The yard lead may need to be handlaid to get the proper "curve" in it like the prototype has (you can see it on Google Earth today, since this yard is used by UP today). That yard lead will need to be laid first, so this needs to be decided rather quickly to keep moving. Install Dishman backdrop and fascia. Both of these need some carpentry done to provide support. I bought extra sheets of masonite a few years ago that I will probably use for both of these, although I installed backdrop in the yard already and that was drywall. Finish switch engines. As stated above, I need to weather the three switch engines so I have finished power. Here's a Dan Holbrook shot of all three of them 6 months after my modeling period. Thank you for reading. Writing this up provides me with a way to set realistic goals and monitor my progress. Have you set goals for your modeling year?